Organic pasta sauce – mushroom (porcini). This delicious, home-made style pasta sauce is made in a traditional Italian way, close to Torino. It uses organic San Marzano tomatoes, organic porcini and other organic vegetables, for a truly authentic, Italian pasta sauce. 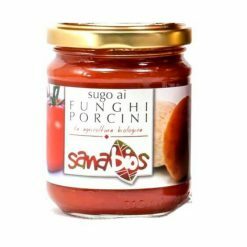 A brand of LEEArc en Ciel, which was established in the Italian province of Turin in 1983, Sanabios is a range of authentic, organic pasta sauces. From olive and basilica to pepperoncino and mushroom, only the finest natural ingredients are used to create these home-made style products. LEEArc en Ciel is designed as a cooperative of young people aiming to provide the best possible taste whilst working with organic ingredients to the strictest quality standards. Ingredients: Organic tomato sauce, organic celery, organic carrots , organic Porcini (Boletus edulis) mushrooms, organic onions, organic extra virgin olive oil, salt.